This page serves as the portal for all papers associated with Data Release 1. For each paper, you can access the PDF, as well as the arXiv link. All papers are also listed on the DES Publications page. All media coverage and press releases can be found on the DES in the News page. If this page formats strangely, please try setting your zoom to 100%. The DES survey area in celestial coordinates. The ~5000 sq. deg. DES DR1 footprint is shown in red. The 8 shallow supernova fields are shown as blue circles, and the 2 deep supernova fields are shown as red circles. The Milky Way plane is shown as a solid line, with dashed lines in a band of 20 degress wide. The Galactic center (‘x’) and south Galactic pole (‘+’) are also marked. The Large and Small Magellanic Clouds are indicated in gray. 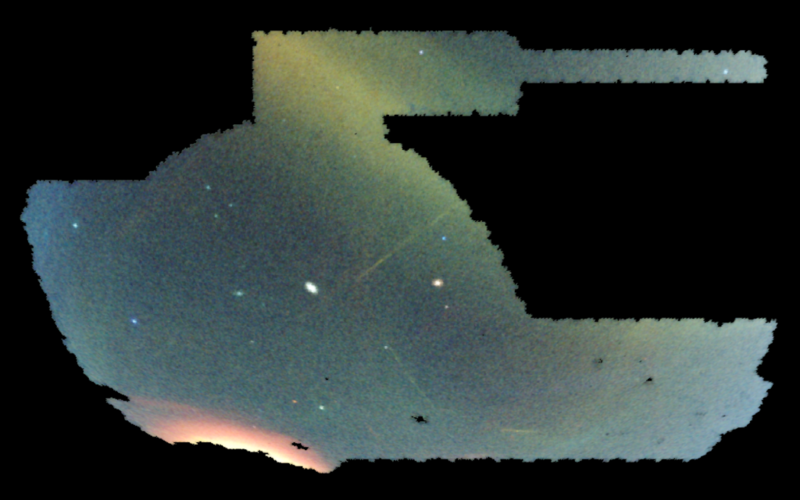 This paper describes and presents the first major public release of reduced images and wide-field coadd source catalogs from the first three years of full science operations from the DES survey. This release consists in over 38,000 single exposure images, close to 62,000 coadd images covering 10,338 tiles over roughly 5,000 square degrees within the DES footprint, resulting in nearly 310 million galaxies and 80 million stars cataloged and served from a public database. DES DR1 constitutes the largest photometric data set to date at the achieved depth and photometric precision. The spatial density of stars in the DES footprint as a color composite image. Blue corresponds to closer stars (~13 kpc), green is intermediate distance stars (~20 kpc), while red corresponds to more distant stars (~32 kpc). Stellar streams appear as linear features at specific distances and can be found criss-crossing the DES footprint. Nora Shipp, Alex Drlica-Wagner, et al. This paper describes the discovery of nearly a dozen new stellar streams in three years of DES data. Stellar streams are the remains of dwarf galaxies and star clusters that have been ripped apart by the gravitational force of the Milky Way. These streams provide important information about the formation history of the Milky Way and can be used to trace the local distribution of dark matter. The unprecedented sensitivity and coverage of three-year DES data set has allowed us to search for fainter and more distant streams than ever before. Since there is no universally accepted naming convention for stellar streams, the Dark Energy Survey has reached out to schools in Chile and Australia, asking young students to select names. Students and their teachers have worked together to name the streams after aquatic words in native languages from northern Chile and aboriginal Australia. Read more about the names in this story from Symmetry. A schematic view of the modules and steps involved in the DESDM Pipeline. Calibration and raw science images are delivered from DECam by SISPI and DTS to NCSA. 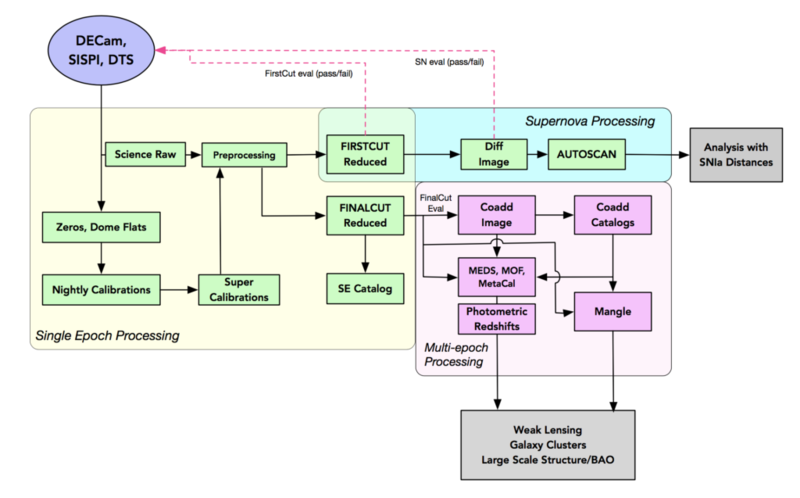 In Single Epoch Processing (yellow box), raw science exposures undergo preprocessing and are combined with calibration images to produce First Cut images for initial inspection and Final Cut images for science releases. Images in the Supernova fields are processed with the Supernova Pipeline (blue boxes). Final Cut images and catalogs are sent to Multi-Epoch Processing (pink box), the outputs of which go to the science groups for validation and analysis (gray boxes). This paper documents the DES Data Management (DESDM) data processing pipeline. It describes the image reduction and calibration procedures that are applied to raw DECam data to produce sicence-ready images. DES wide-field survey images are coadded to increase imaging depth, while DES supernova exposures are difference imaged to enable transient source detection. It also describes the procedures for producing catalogs of astronomical objects and auxiliary data products to enable DES science. Movie by Alex Drlica-Wagner that steps through the Milky Way stellar halo from distances of 10kpc to 63kpc. The distance steps are logarithmic and vary from 0.5 kpc (close/earlier frames) to 3kpc (far/later frames).